Lets start with an original image, no cropping no scaling. Below is the stack of 5 images (this is to keep the noise a bit down) from the raw AVI file i captured with an Imaging Source camera, DMK21. Posting this image on the web will change the actual size of the image but the original image is 640 * 480 pixels in size. I am also using a 2.5X barlow lens from televue (one of the best barlow lenses i have ever used). Now lets use this number.. but how? Astronomy should be fun for those as well who hate maths! (I don't actually hate maths but would love to be lazy enough to allow a calculator doing all the hard work for me). So putting the numbers in CCD Calc, i see focal length becomes 1245 mm and f/ratio is gone at 21. Each pixel in DMK21 has a measurement of 5.6 micro meter and this gives me an image scale of 0.93 arcsec/pixel. This means that every pixel on my chip is seeing 0.93 arcsecond of the sky (which is very very tiny, Our Sun or Moon you see in the sky is about 1,800 arcseconds is size). Now i need to find out the area being covered in 0.93 arcseconds. This is also not difficult at all. One of the first formula astronomy students learn is called the small angle formula. This allows to calculate the original height of an object, if we know the angular size of the object and the distance between the observer and the object is known. I used StarryNight software to see the distance the sun had yesterday at the time of imaging, which was 1.016391237 Astronomical Unit. This corresponds to 1.52049965*10^11 meters. So using the small angle formula, with my setup, 0.93 arecsecond here in this image is equal to 685 km! I have marked the prominence in the yellow box to count the height and width of the whole area. 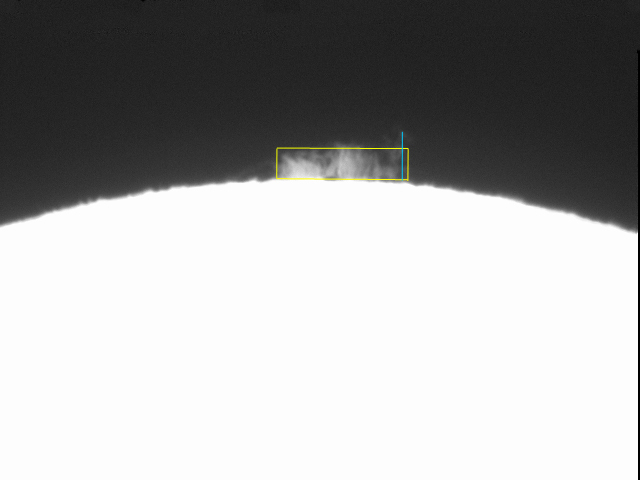 On the right is a higher prominence which is marked with blue. After counting the pixels and multiplying it with per pixel area, here are the result. The height of the highest point on earth is of Mount Everest, which is less than 9 km. Now you can see the highest part (right) of this prominence is more than three thousand and five hundred times of the height of Mount Everest! Imagine standing at the base of this prominence (lets call it a mountain of rising fire) and watching it rise that high in the sky. The width is about 90,000 km.. this is more than double the length of the distance you would make if you travel the whole planet Earth through the equator. Now look again on the top image.. how humble and small this prominence looks.. yes, looks can be deceptive.